This cozy brick 2BD 2BA lakefront home has one of the best views on the lake of the Uwharrie National Forest and feels like it belongs all to you. Located approximately 1 hour from Charlotte, Greensboro, Winston Salem and High Point. This slice of heaven is just perfect for a small family vacation, anniversary, friends' getaway or fishing retreat. Master with a queen bed and small 2nd bedroom with twin bunk beds. Great layout for a couple or families of 4. (Beds for 4 adults). A large screen enclosed porch with ceiling fans and comfortable furniture serves as a second living room overlooking the lake and Uwharrie National Forest. Inquire if you have a child as a 5th guest/addtl 25/nt. Maximum total guests allowed is 4 (day or night). Day guests w/prior approval. NO PETS policy. A dock and steps leading into the water are convenient for taking a cool dip. Bring your boat or jet ski and enjoy fishing and the serenity of the lake's 115 miles of shoreline. The dock has room for a boat or jet ski to tie up and access to deep water. Amenities include a fully equipped kitchen, washer/dryer (in the basement), utilities, wifi, (no phone but most cell services work well), gas grill for outdoor cooking, fire pit with Adirondak chairs, satelite Dish televisions, dvds, books and games. A large hot tub with a fabulous lake view is located beneath the screened porch area (great for when it is raining). A covered gazebo to give you a place to get out of the sun but still enjoy the incredible views. A large yard for tossing the football or frisbee. A canoe is available (with life jackets) to enjoy exploring the lake or fishing for dinner. And of course, a hammock for an afternoon nap. Parking for 2 cars and a nearby boat ramp at the Wildlife Marina on Blaine Rd within 2 miles or a small neighborhood ramp 3/4mi away. Spend the day boating, swimming, fishing, or simply relaxing on the pier with the sound of the water soothing your stress away. For those seeking more adventure... hike or bike the Uwharrie National Forest across the lake (accessed a few miles away by car). Pontoon boat rentals may be available from Skallywags or Ole North State Marina. Within 30 minutes... North Carolina Zoo in Asheboro; Seagrove, NC-Pottery Capital of North Carolina and Dan Nicholas Park in Salisbury. Golf at nearby courses or 40 minutes away at Pinehurst, visit the museum of Nascar’s legend, Richard Petty; or take a caution lap around the track at the Lowe's Motor Speedway. Take in a new release movie at the Drive In Theater 1/2 hour away in Albemarle or a zip line ride in Asheboro. One hour away…the Lazy 5 Ranch in Mooresville, NC where you can get up close and personal with an abundance of exotic animals from six different continents... visit Carowinds theme and water park or the National Whitewater Rafting Center 1 1/2 hrs away or you can search for Big Foot in the Uwharries right across the lake! We fell in love with the lake the first time we visited and knew we wanted to live there someday. Since we live a short drive away we steal away every chance we can until we are there full time! 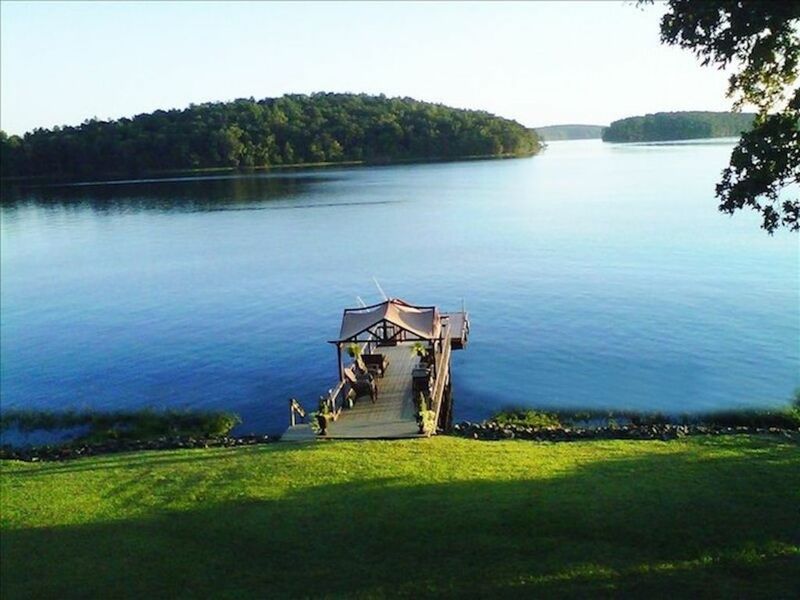 We chose this location on the lake because it is located directly across from the Uwharrie National Forest with an untouched and beautiful view. If you wish to explore beyond beautiful Badin lake there are plenty of other nearby activities to keep you busy. Activities that include - Adventure - US National White Water Center, Richland Creek Zip Line; Uwharrie ATV Rentals; Animals - Asheboro Zoo, Lazy5 Ranch, The Alpaca Farm; Art/Furniture - Bob Timberlake Gallery, High Point Furniture Market; Wine - Childress Vineyards; Race cars - Charlotte Motor Speedway, Nascar Hall of Fame, The Richard Petty Museum in Randleman; Trains - North Carolina’s Transportation Museum in Spencer; Golf - Tot Hill Farm - 20 min, Badin Inn Golf, Grandover or Pinehurst - 1 hr. Shopping - Pottery - Seagrove, Concord Outlet Mall; Hiking and rock climbing - Morrow Mountain, just east of Albemarle. Restaurants - Badin Inn - 35 min; other small restaurants 15-20 min away. Bedroom 1 - shower/double sink and toilet. Bedroom 2 - small bathtub/shower combo/pedestal sink and toilet. One of the best views on the lake! Yard gently sloped to the dock and covered gazebo. The Uwharrie Mtns (hills) are all around the lake and within view. Washer and Dryer located in basement. Towels, hand towels, wash cloths, kitchen cloths and lake towels for outdoor use all included in linen fee. 3 loads of laundry are included in cleaning fee. Open floor plan - living room, dining room, kitchen. All with views of the lake. Ice maker and water dispenser. Several spices and salt and pepper. Well stocked kitchen with place settings for 6, including plates, salad plate, bowls, glassware, wine glasses, etc. Full selection of utensils and serving pieces. Cork screw, pizza cutter, etc. Inside dining seats 6. Bar seats 3. Dining available on the screened porch as well. (3) Living room, bedroom 1 and 2. All have Dish Network. Blue tooth mini. ipod station/radio/cd player. DVD players in living room and Bedroom 1. Up to 50 books. Adult and Children. 4-6 board games for children. 50+ dvds. Extensive selection for all ages. 3 man canoe w/paddles and life preservers. 1 single kayak. Must follow guidelines for safe use. 1 fat tire bike w/helmet. Screened Porch with full lake view. Comfortable furniture for relaxing. 2nd Patio lounge area beside hot tub beneath screened porch. Floats, and old school skis. There are 3 steps onto the property and 2 steps from the kitchen to the living area. There is a walkway to the hot tub area if steps are not preferred from the screened porch. Located beneath the screened porch w/access from porch or basement. Low overhead room but great view of the lake and sky while staying out of the elements. Addtl instructions must be read before use. Large Screened Porch with Ceiling Fans and Comfy Furniture, Canoe with Life Jackets. We enjoyed our stay on the lake. the house is set-up very well. Laundry, wi-fi, cable, nice linens, great flow between kitchen/living room. But the views, lake access, sun porch & dock make it truly special. this is a great property and Kay and Russ have it set-up really well for renters. we look forward to our next trip back. Me and my new wife were here for our honeymoon and this house and Russ and Kay are perfect. They were helpful every time we called. Left a handy notebook for any questions you might have and was just a delightful home to rest for a week and recharge. I would recommend everyone to come here. It was a delight to be able to use a hot tub morning and night. It was a perfect house. If you are someone who likes a nice and quiet vacation like us, would want to spend the day in a canoe on the lake fishing, then this is the place for you! Thank you Russ and Kay! This was my second time staying here. Both times I have used it to take a solitude retreat. This place has the main components I always look for when selecting a rental house to unplug from the busy world. Those main components are a place that feels secluded, and that has multiple seating locations with great vantage points. Although the house is in a neighborhood, the trees that line the property make you feel as if you are far from other homes. There are so many amazing places to sit from and enjoy views of the lake. The heated porch, the fire pit, the dock, and many more. I have been taking annual solitude retreats for years, but this is the only house I have loved enough that I have stayed at again. I can't wait to stay again! This home has a beautiful view of the Uwharrie national forest. The trees lining the property give you a very private feeling. We went in October, and the lake was still 76 degrees, so swimming and boating were great. The house is very tastefully decorated, and the owner thought of pretty much everything to make our stay easy. The bed was comfortable, there were cooking items like spices available, a spacious living room with a nice TV/DVD player, and a great screened in porch with a view of the lake. Additionally, there is a hot tub under the porch with the same great view. We encountered hurricane Michael during our stay and the owners kept in touch to let us know about a power outage that the whole neighborhood had. Overall, a really pleasant vacation home. The house was everything we expected from the online profile and more. The screened in porch was our favorite spot in the house! What a great view of the lake. We spent every evening out there with books and cocktails. Pontoon Boat Rental at Fish Tales Marina and Grill. NC Zoo is about 40 minutes away, Lazy 5 Ranch about 1 hour away, Charlotte Motor Speedway about 1 hour away, Concord Mills about 1 hour away. Badin Inn Restaurant and Golf Club is a short boat ride south to the Alcoa landing where you can also visit the town of Badin. If you call ahead, you can arrange a golf cart pick up from the Restaurant to have a delicious and affordable dinner. Our favorite - the Classic Johnny Palmer Sandwich - prime rib on a hoagie with au jus dip. Tank n Tummy Gas station and small convenient store. Fill up the boat and jet skis, ice, snacks, drinks, etc.